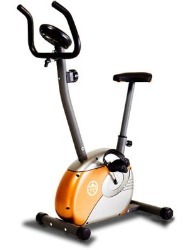 Cheap Exercise Bikes – What Do You Really Get For Your Money? When buying decent but cheap exercise bikes, there are a few things to look for. You want it to be generally quiet in operation, not feel flimsy but have a solid construction, provide some resistance in the pedals, be comfortable, and offer good value for the price you pay. Sorting bikes into groups according to style and price is a matter of interpretation. Cheap exercise bikes include those low-cost $20 mini pedal exercisers, a stationary upright bike for around $90 to $180 is certainly inexpensive, and a recumbent for under $400 would still be considered an economical model. 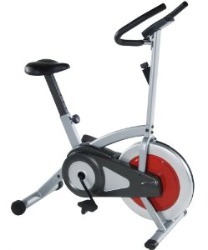 For example, a Schwinn Exercise Bike will range from $198 to $750 but they aren’t “cheap” in terms of quality: these are well-designed, solid units. While $750 may seem pricy for a home upright bike, when compared to the cost of a treadmill it is very affordable for a cardio machine. And when you consider the fact that a Schwinn Airdyne ($650) can last 20 years or longer, it tells you that the price-to-value ratio is exceptional. When you start shopping for cheaper, low-cost models, your preference in the bike style comes first. What type of exercise bike are you going to get? There are upright bikes, recumbent bikes, semi-recumbents, dual-action (with handlebars for upper body workouts), and mini pedal exercisers. Next, even cheap exercise bikes should be comfortable in the saddle or you won’t ride on a regular basis. You must be able to adjust the height and level of the seat so your feet can easily reach the pedals without overextending the knees or feeling cramped. You should also consider how easy it is to mount the bike. Look for step-through open designs if you are unable to lift your leg over a center bar. Resistance typically is provided by magnetic force, mechanical friction, or wind (from a fan wheel). The resistance can be adjusted manually by turning a knob when you are not on the bike, or electronically on the console. Electronically adjustable resistance will add to the price of the exercise bike. Most people want quiet operation when pedaling. 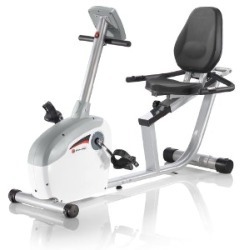 Exercise bikes with magnetic flywheels and electronic drives offer near silent operation at all speeds. Fan bikes such as the Airdyne are much noisier because the open fan wheel provides wind for resistance, but they have so many advantages that the noise is a trade-off. Console features will include basic readouts for time and distance, and might have more elaborate options such as heart rate monitoring, pre-set workouts, etc. Some other nice additions to look for would be a water bottle holder, book rack, or even an in-console fan. The bikes that cost upwards of $500 will also feature iPod plug-in ports and speakers, and LCD screens with more elaborate readouts. A bike’s long-term durability is often suspect in an inexpensive bike. This will take some more research since most cheap exercise bikes are not built with the best components. If you intend to use the bike for light to moderate use, chances are you won’t have problems. If you intend to ride five or more miles a day, nearly every day, it would be advisable to buy a better bike, the best you can afford. A good model at around $400 or more can last 10 years or more, which is why you should consider buying a better quality machine. Many discount exercise bikes that cost less than $200 have a parts warranty that only covers 90 days – which should give you some idea as to the quality (or lack of). There are many cheap exercise bikes that offer a number of features, a solid frame, and also get decent reviews from equipment pros and consumers. Do your research and take notes on several models, and test drive them at local retailers if you can. If that is not possible, be sure to check the size and weight of the bike, and the type of resistance system along with the reviews, to see if the bike will be a good fit for you.